One of the things I love most about cooking vegetarian is the color. It is almost impossible to create a dish that isn’t appealing (beyond a few beige items, but even then a few fresh herbs can help!) I sometimes create meals based on the contrast of colors to make the meal more appealing. One of those dishes that comes to mind is this Pesto Polenta with Smokey Chickpeas. When I was playing with flours for The Homemade Flour Cookbook, I fell in love with black bean flour. It had a fairly mild flavor profile and the color, after cooking, had this beautiful purple hue. I loved the color so much, I even made black bean tofu. In the cookbook, however, I made black bean pasta. Since then, it’s become a staple in my kitchen. Of course, I know not everyone is as ambitious as I am when it comes to grinding their own flour (or making homemade pasta). I am excited to share this recipe with you using Ancient Harvest’s Black Bean Pasta. 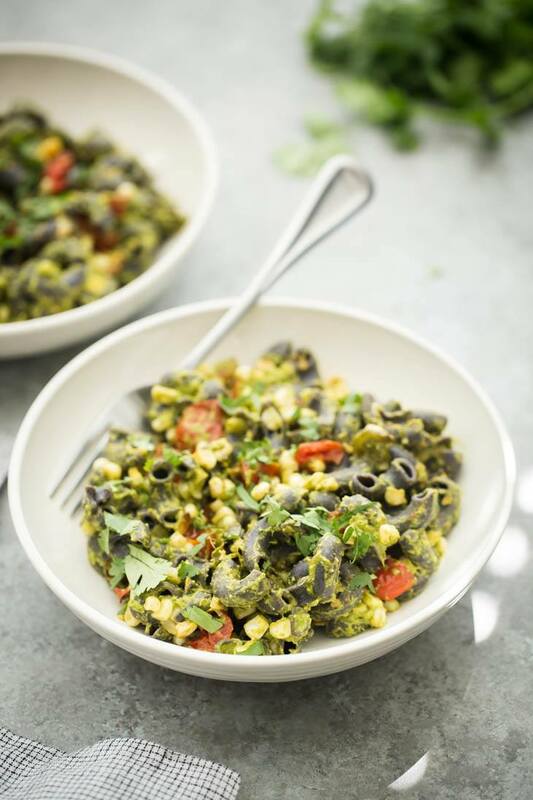 Their pasta contains three simple ingredients: black bean flour, brown rice flour, and quinoa flour and has a gorgeous color after cooking. This color makes for such a unique spin on any dish. Of course, you can always make this with any pasta- regular or gluten-free. 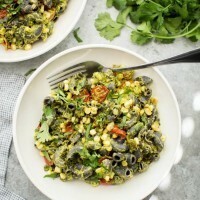 In this case, it’s a summer pasta dish topped with one of my favorites, a chipotle cilantro pesto. It’s a bit spicy and packed full of flavor. Plus, by using AH’s pasta, this dish is gluten-free and vegan! I usually make extra of the cilantro pesto to use on tacos, in quesadillas, and on breakfast egg skillets as well. While I would be perfectly content eating this pasta for lunch, I think it also goes great to complete a dinner. Instead of having a side of the traditional rice/beans, this pasta is a fun (and unique) substitution that can either be served hot or chilled making it perfect for picnics/cookouts! Main: Tacos- you can have your pick but I’d really recommend some spiced black bean tacos with avocado. Heat oven to 400˚. 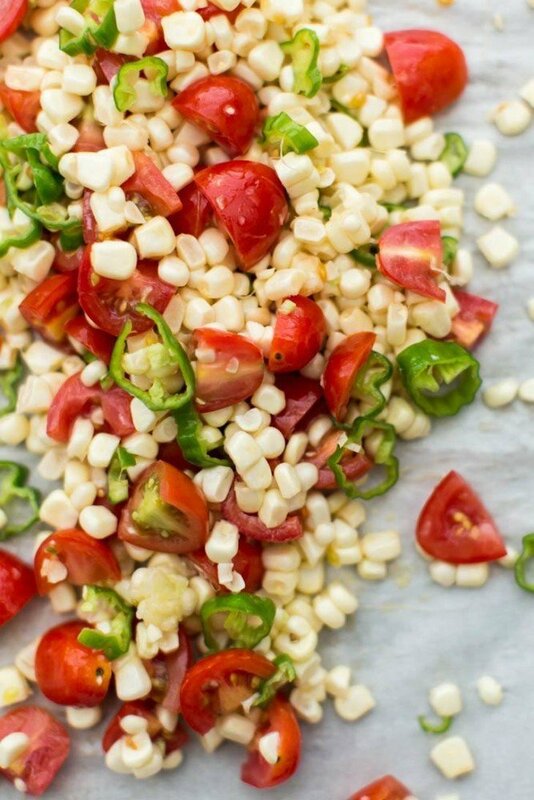 Remove the kernels from the cob and combine with the grape tomatoes and jalapeno. Toss with olive oil and spread out on a baking tray. Roast until tomatoes are tender an corn is cooked, 20 to 25 minutes. Cook pasta according to box. Drain, place in a bowl, and toss with sweet corn mixture. In a blender, combine the ingredients for the pesto. Puree until combined. Add more olive oil/lime juice if the cilantro leaves are not pureeing. 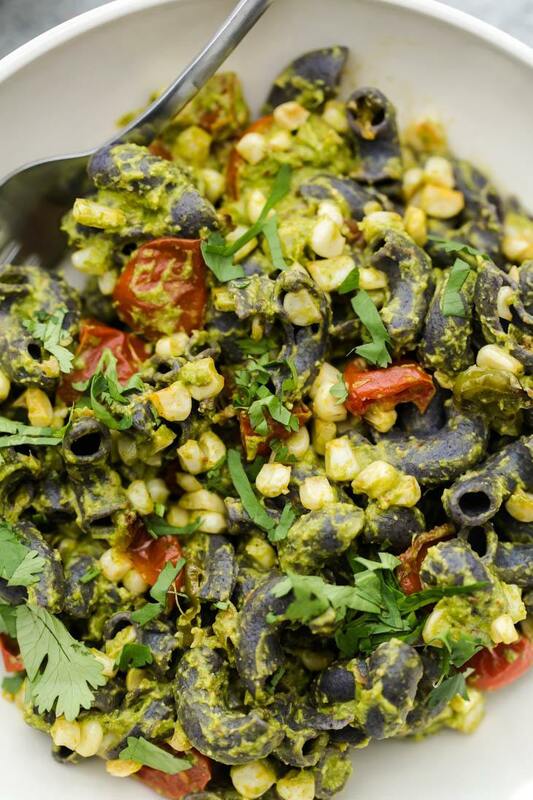 Combine the warm pasta with the roasted corn mixture and pesto. Serve with a sprinkle of cilantro. Add some cheese: I personally would toss on a bit of cheese, like crumbled cotija. However, the the cheese is completely optional- it’s a flavorful dish without! I have never seen this pasta. I will have to try to find it and try this. 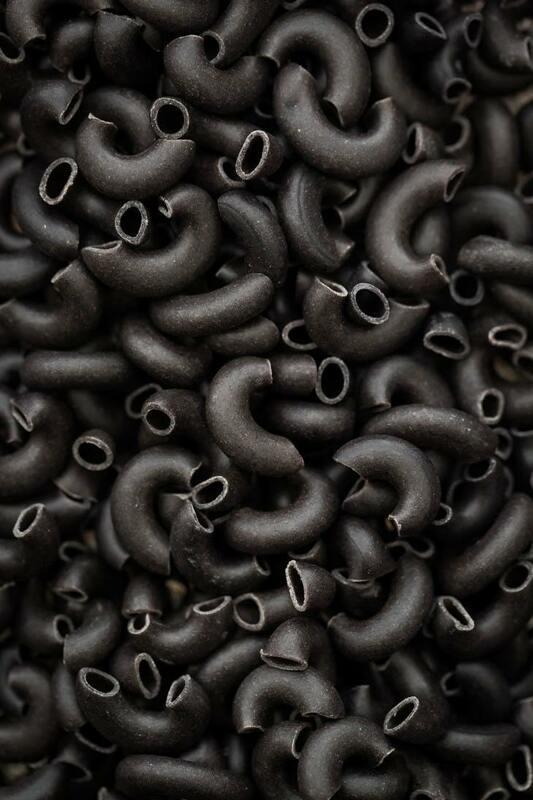 Oh that looks incredible – especially the black pasta sounds incredible. Need to find out where to get my hands on one of those things here in Austria. 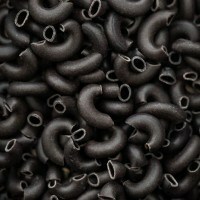 I’m so intrigued by that black bean pasta!… Thanks for introducing it to me … can’t wait to find it and try it! WELL THIS IS AMAZING. 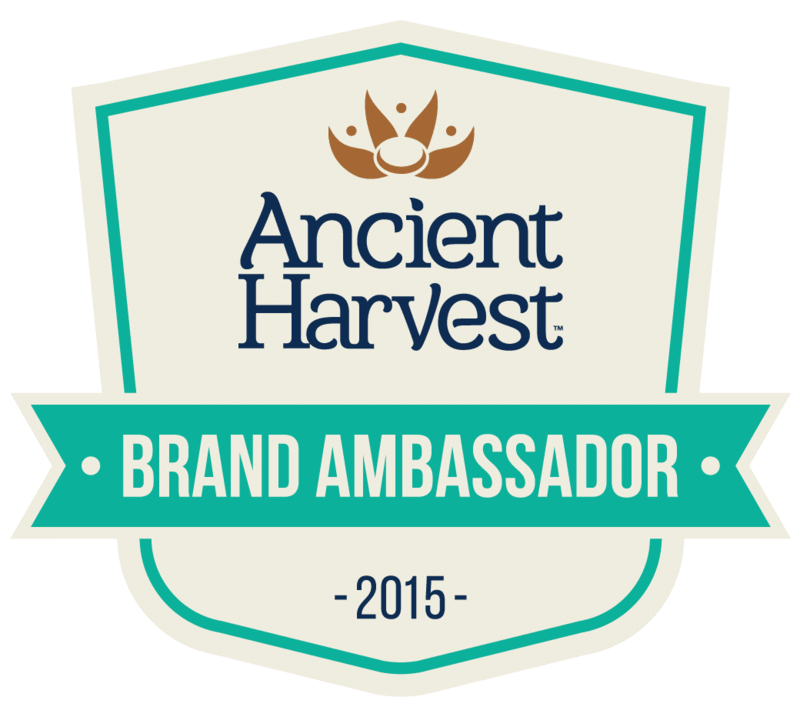 I love (loooove) Ancient Harvest and am gonna have to search high and low for this pasta tomorrow. Can’t wait to try this recipe, lady! 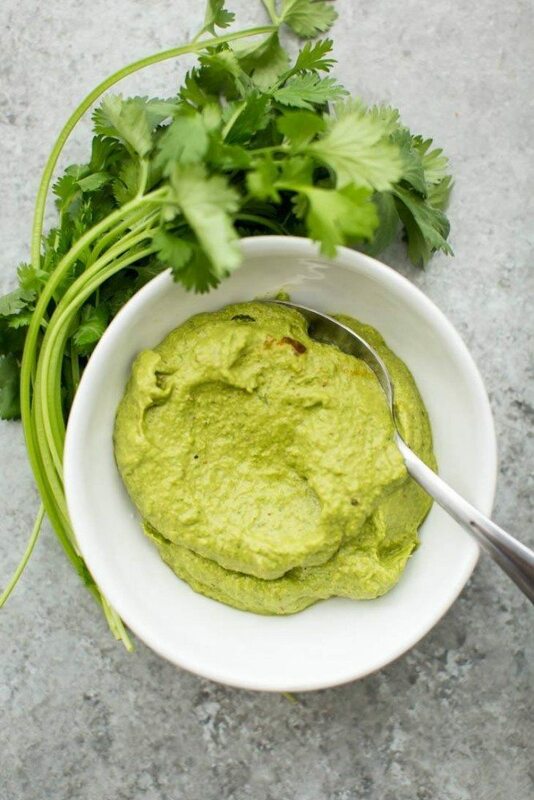 I love the combination of Mexican-inspired flavours in a typically Italian form, like the cilantro pesto. I’m also someone who thinks about food in terms of colours – and thank goodness for beautiful herbs when delicious food happens to be beige! I love the colors of vegetarian cooking as well — eat with your eyes first! And this dish sounds so delicious and hearty! 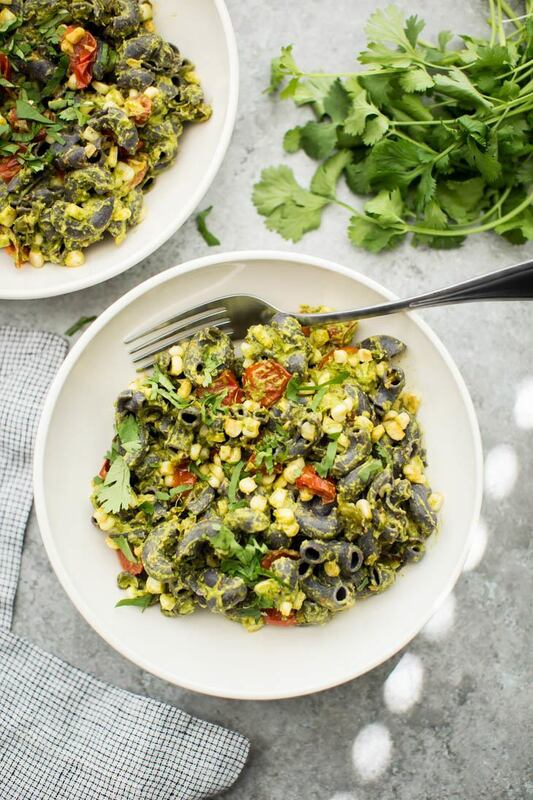 This black bean pasta is beautiful! Love the cilantro pesto too. 🙂 Pinning! The black bean pasta looks amazing. The cilantro pesto sounds good, too. I wonder if I could make the pesto with basil since I have tons of it in my garden. Hi Erin, I really appreciate how you have added in the feature about ideas for what to pair the dish with to make it a meal or as a side and appetizer. It is really helpful! Thanks for all you do – I LOVE your site. I also like all the colors in vegetarian dishes. And this one takes it to another level. Really beautiful. Excited to try it! Usually I just pick up a can at the grocery store- nothings special!